The Battle of the Wilderness marked the first stage of a major Union offensive toward the Confederate capital of Richmond, ordered by the newly named Union General-in-Chief Ulysses S. Grant in the spring of 1864. 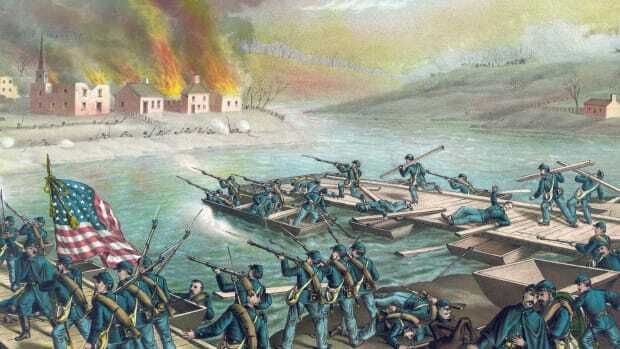 As the Army of the Potomac crossed the Rapidan River on May 4, Confederate General Robert E. Lee determined that his Army of Northern Virginia would confront the enemy in the dense Virginia woods known as the Wilderness. Familiar terrain for the rebels, the heavy woods and dense undergrowth also negated the Union’s numerical advantage–115,000 to 65,000–by making it nearly impossible for a large army to make an orderly advance. Two days of bloody and often chaotic combat followed, ending in a tactical draw and heavy casualties, especially on the Union side. 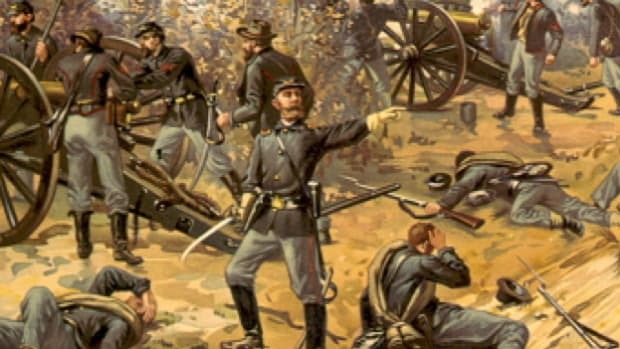 Grant refused to retreat, however, and instead ordered his battered troops to continued southward in what would be a long and costly–but ultimately successful–campaign. In February 1864, President Abraham Lincoln appointed Ulysses S. Grant as commander in chief of all Union armies in the Civil War. Wasting no time, Grant began planning a major offensive toward the Confederate capital of Richmond, to be known as the Overland Campaign. His primary goal was to engage Robert E. Lee’s famed Army of Northern Virginia and keep it under pressure to defend the capital, making it impossible for Lee to send more soldiers to defend against the Union advance into Georgia led by William T. Sherman. Did you know? The onward advance that General Ulysses S. Grant ordered after the Battle of the Wilderness marked the first time in the course of the Civil War that the Army of the Potomac had continued on the offensive after an opening battle in a Virginia campaign. Over the winter, Union and Confederate armies had faced each other across the Rapidan River in northern Virginia. Grant now ordered around 115,000 soldiers of the Army of the Potomac, led by George Meade, to cross the Rapidan on May 4 and march through an area of dense woodland known as the Wilderness, which lay along the river’s southern bank. 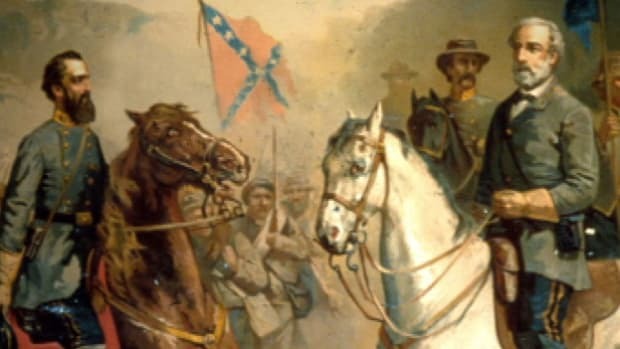 Though Grant had been planning to march quickly through the Wilderness and slip behind Lee’s right wing, the Confederate general (who had some 65,000 troops) decided to confront the enemy in the familiar terrain of the Wilderness, in order to overcome some of the Union’s numerical advantage. The Battle of the Wilderness began in earnest on the morning of May 5, when Confederate corps led by Richard Ewell clashed with the Union’s 5th Corps near the Orange Turnpike, the region’s principal east-west road. The fighting was fierce and chaotic, as the trees and thick undergrowth made it difficult to move in an orderly fashion and negated the effect of both cavalry and artillery. Men on both sides stumbled into enemy camps and were made prisoners, and fires ignited by rifle bursts and exploding shells trapped and killed many of the wounded. Halted by darkness, the first day of battle was inconclusive, with both armies remaining more or less where they had begun that morning. For their part, the Federals had been able to hold their positions and gain a position from which they could attack Lee’s right wing. 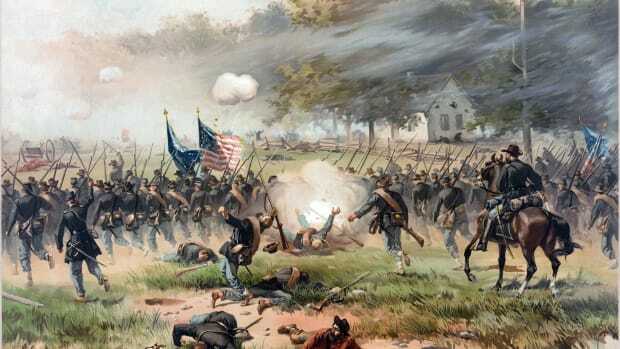 As reinforcements arrived on both sides that night, Grant ordered an attack for 4 o’clock the next morning. Meade persuaded him to postpone slightly, as corps commanders were still struggling to organize their men after the chaos of the day’s fighting. Shortly after 5 a.m. on May 6, the Union 2nd Corps, led by Winfield Scott Hancock, attacked along the Plank Road. Advancing in a battle line more than a mile long, the Federals were able to drive back A.P. Hill’s Confederates nearly a mile. The rebels were aided from collapse by the arrival of a corps led by James Longstreet (with Lee in its midst, urging his soldiers onward). Fighting was even more intense than the day before, with stifling smoke and fog that forced soldiers to fire blind, with little idea at whom they were aiming. Around noon, Longstreet led the Confederates in a damaging counterattack on the Union left, but was shot in the shoulder accidentally by one of his own men. (Unlike Stonewall Jackson at Chancellorsville, he would recover, but would be out of commission for the next five months.) The ensuing Confederate disorganization allowed Hancock to organize defenses along the Brock Road, and Union troops were able to hold their ground when the rebels renewed the attack. At dusk, Lee ordered another attack (led by the aggressive Georgia brigadier John B. Gordon) on the exposed right flank of the Union line, breaking through two brigades and sending soldiers flying back to Union headquarters with panicked reports of defeat. 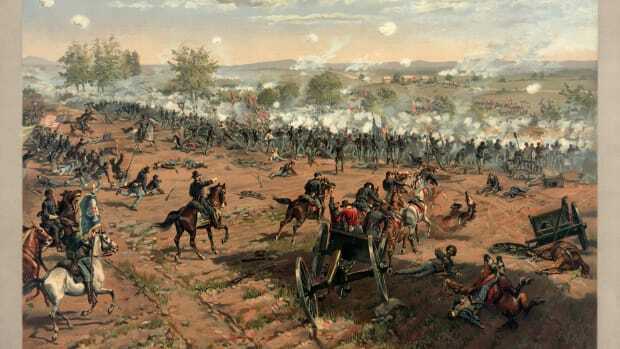 Grant held his ground, however, and the Federals were able to stabilize their position, despite heavy losses. By the morning of May 7, the two armies were essentially where they had been at the start of the battle, 48 hours earlier. 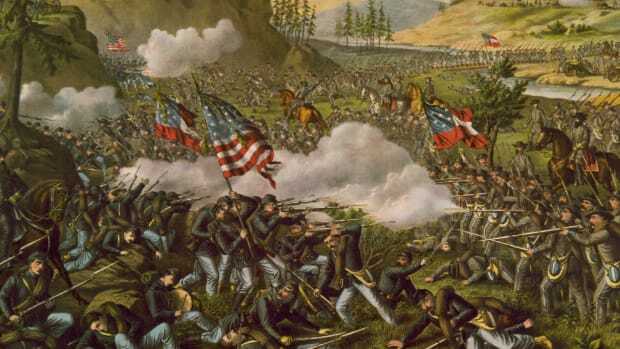 The Battle of the Wilderness ended inconclusively, though the Union Army suffered more than 17,500 casualties over the two days of fighting, some 7,000 more than the toll suffered by the Confederates. 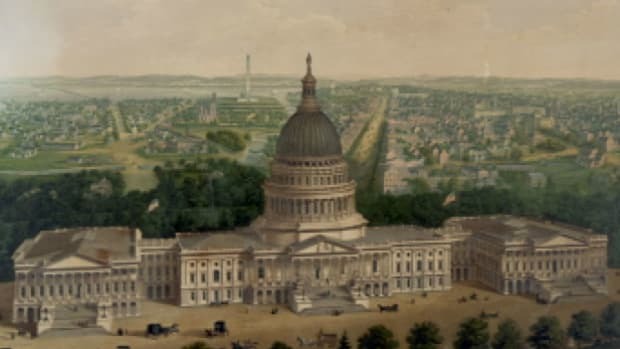 Despite the costly nature of the battle, Grant refused to order a retreat, having promised Lincoln that regardless of the outcome, he would not halt his army’s advance. 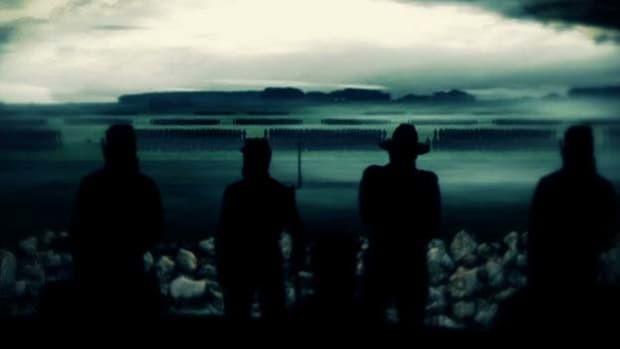 That night, exhausted Federal troops left their trenches and began marching south, toward the lower edge of the Wilderness. 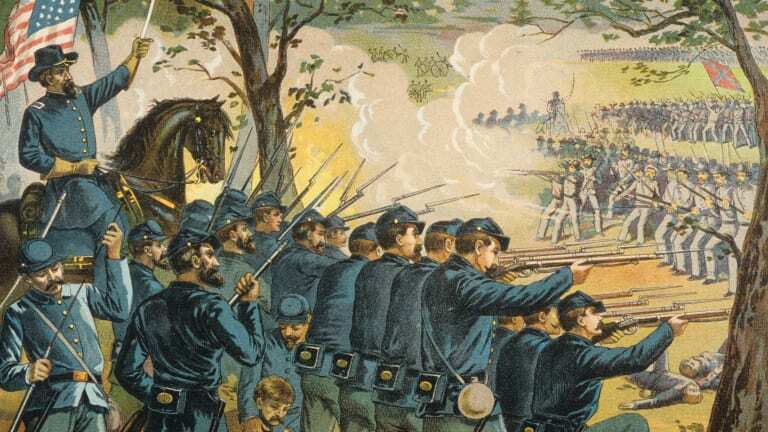 As Grant came riding to the head of the troops, the blue-coated soldiers slowly realized they were not in retreat (as had been assumed), and broke into wild cheering. 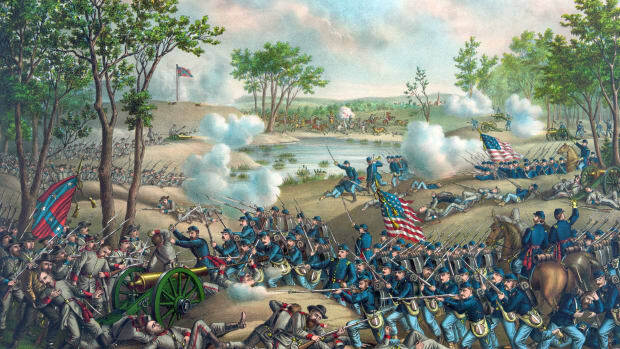 The Federals marched towards the crossroads town of Spotsylvania Courthouse, but Lee’s Confederates managed to get there first, stalling the advance again in a series of confrontations beginning on May 8 and lasting nearly two weeks.